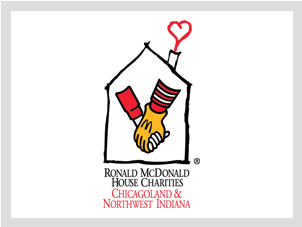 Ronald McDonald House Charities® of Chicagoland and Northwest Indiana (RMHC®-CNI) is an independent not-for-profit 501(c)(3) organization whose mission is to care for families of children with complex medical needs by providing a ‘home away from home’ while their child is being treated in the hospital. Every night, 140 families heal together because of the comfort, compassion and community at five area Ronald McDonald Houses® and three Ronald McDonald Family Rooms®. That’s 40,000 nights each year where RMHC-CNI families are able to stay close to their child, helping them to heal faster and saving them over $7 million in hotel costs. We are located near Advocate Children’s Hospital, Loyola University Medical Center, University of Chicago Comer Children’s Hospital, Ann & Robert H. Lurie Children’s Hospital of Chicago, Edward Hospital in Naperville and Central DuPage Hospital which will open in 2015. For more information visit www.RonaldHouseChicago.org. RMHC-CNI is rated as BBB Accredited Business & Four Star Charity Navigator.